with most collaboration’s the footwear will span the wide age range of Hello Kitty fans, the designs will be available in adult and children’s sizes. SANRIO, Inc., best known for global icon Hello Kitty® and Vans, the iconic California footwear giant, have announced a co-branded footwear collection for fans of all ages. The limited edition collection will make its retail debut in July 2011; the agreement is effective immediately. 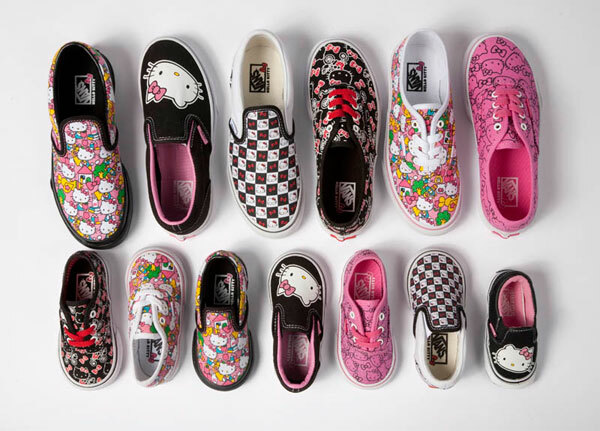 The Hello Kitty Vans collection is designed to appeal to fans of both brands, melding signature Hello Kitty graphics with classic Vans styling. The retro black and white checkerboard Classic Slip-On is a highlight with Hello Kitty faces appearing in white squares; it will be available in kids and adult sizes. The Classic Slip-On is also offered in black with an oversized Hello Kitty face on the toe; in crib shoes to adult sizes. The low-top, laced authentic style will be offered in a variety of all-over prints in both size ranges; while the high-top Sk8-Hi D-Lo, in a cute custom print, will come only in adult sizing. The Hello Kitty Vans collection will be available at Vans Retail and Vans dealers as well as select Sanrio Boutique Stores and Sanrio.com in July 2011, just in time for Back to School. Retail prices will range from 25 Euro for an infant and 30 Euro for a child’s Classic Slip-On to 75 Euro for the unisex Sk8-Hi D-Lo high top sneaker. This entry was posted in Collabrations, Hello Kitty and tagged collaborations, Footwear, hello kitty, Hello Kitty Foot Wear, Hello Kitty Vans, New Hello Kitty Products, sanrio, Sanrio Products, Vans. Bookmark the permalink.